Wingspan 5 to 6 mm. 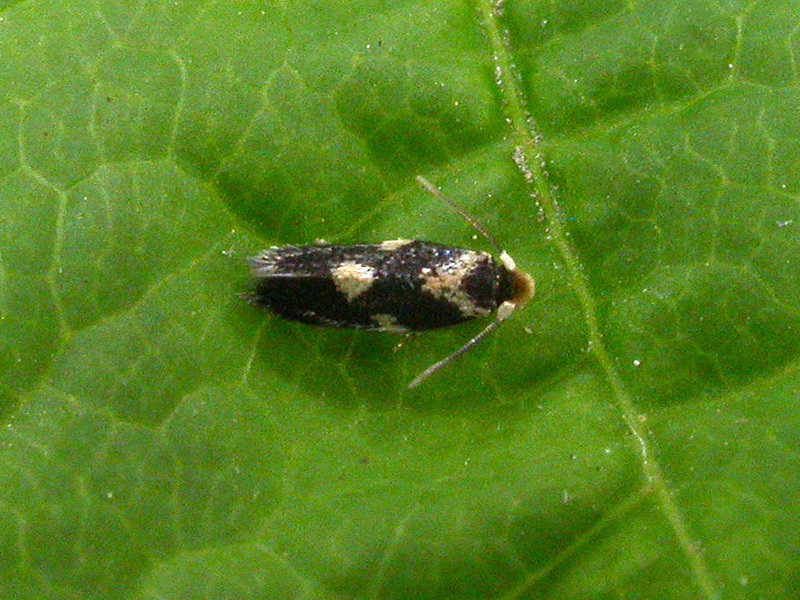 The adults are similar to E. heringi but otherwise quite distinctive, with two creamy spots and a creamy basal patch on a violet-tinged blackish forewing. 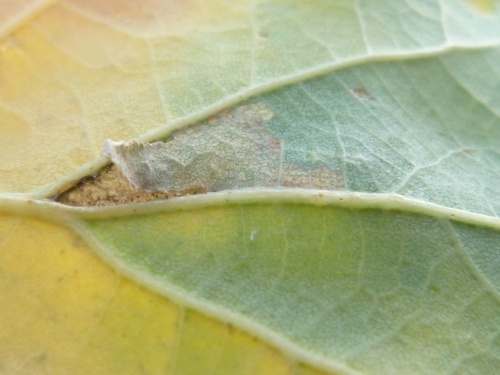 Adult Leafmine Check underside of leafmine to see open slit or flap for removal of frass. 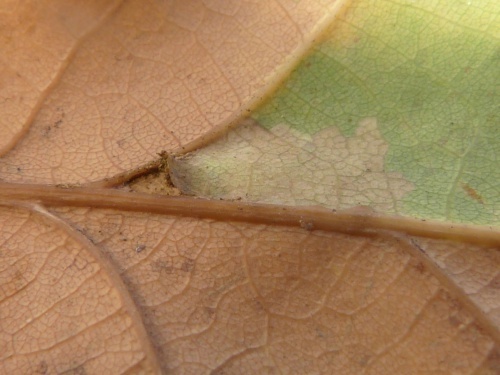 The larvae mine Oak leaves, initially in a gallery following a vein, then creating a triangular blotch between vein and midrib. 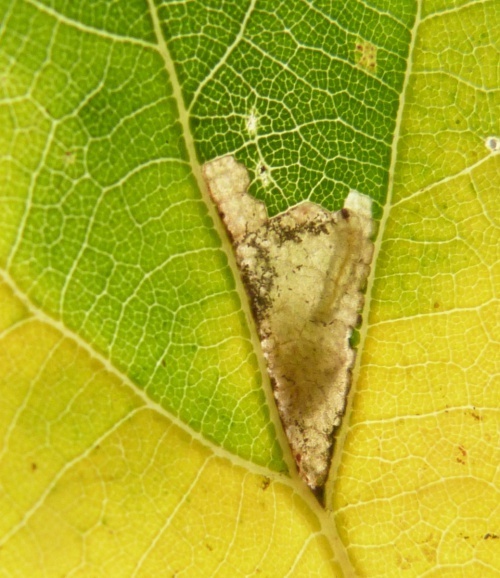 It can be distinguished from the similar mines of E. heringi by the presence of a slit or lose triangular flap in the lower epidermis which allows frass and water to pass. 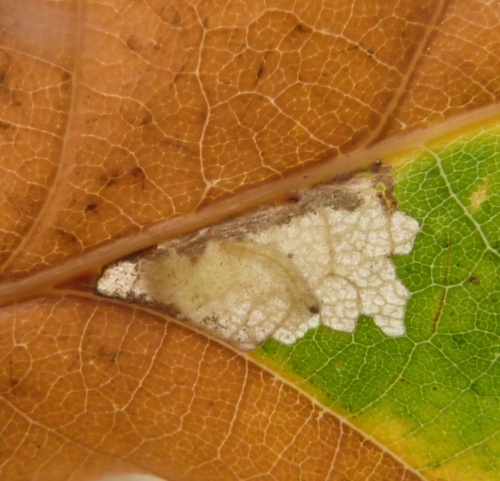 Any leafmine records for this species should be accompanied by images showing the underside slit as well as a backlit image of the mine showing the low amount of frass. Commonest in south-east England, the distribution expands north and westwards. In the Butterfly Conservation’s Microlepidoptera Report 2011 this species was classified as common. Occasional in Leicestershire and Rutland. L&R Moth Group status = C (very scarce resident or rare migrant). It is probably more common that this rating suggests as its tiny size and difficulty of identification probably means that the species is under recorded. Underside - with open slit or flap for removal of frass.